The ‘koburu‘ (surf season) ended in May which was a big success. After several years in the making, we opened our Solwata Surf Camp in the Lau Lagoon in December in partnership with John Maoma and his tribe. With super comfortable beds, solar powered fridge, an amazing verandah, a private boat landing area, an eco style compost toilet that does not requiring ‘walking the plank’, the Solwata camp steps up the standard of our surfing guests. It was another season of world class surf with plenty of perfect waves to share. The trips were led by a combination of guides including Tony, Steve, Simon and Craig. A few trips had smaller waves – the luck of the draw with any surf trip. Unfortunately this seemed to happen whenever a professional photographer was around – Chris, Joel, David! But generally, there’s been a lot on offer. Kilu, the right hander opposite Eidu, was surfed for the first time and offered some of the biggest waves yet. Other breaks surfed for the first time including ‘Yam right’; a long right hander with fast bowling sections, and ‘Up the waisies’ a fast, fun left that sacrificed a few fins. We have yet to see its full potential which looks like it could be epic. From Solwata, we ventured out to a new village-stay at a very beautiful small island surrounded by white sand beaches and located right next to Nines, which was consistent and hollow as ever. That brings our total village stay options to three on excursions from Solwata. We plan to develop at least one of these sites into self contained surf camps over the next couple of years. Our camp guests ranged from the young, the older and everything in-between. Also, we had several non-surfing guests this year who had as good of a time as those looking for perfect waves. A few boys and girls at Kwatonaere have formed the Eidu Boardriders Club with advice from visitors Bruce Fergie and Steve Evans. Bruce is having some t-shirts made up and next season the club is planning to formalize their operations to promote surfing among the local community. Wane, Charles, Kwai and others go from strength to strength with their surfing and the girls are slowly getting there when they get a chance. We are hoping to help them get their own boards. Speaking of which, Joel from Saltmotion has kindly offered to take the lead in organising a shipping container of surfboards, surf gear and a bunch of supplies for local schools. The fundraising drive will start at the Manly Surf Festival in Sydney with the aim to send the gear out in late 2012. We also recently had a publication in Smorgasboarder Magazine; check out the article HERE – page 54. John Maoma was able to provide some substantial assistance to his tribe after two years of helping to build the new surf camp as joint venture partners. Ten solar systems were provided to local families in the tribe and Surf Solomons made a valiant attempt to send Joseph Wane to a Melanesian surfing comp in New Caledonia but unfortunately, it did not quite work out. is getting close and bookings are rolling in. This past season was our most successful to date and we expect the upcoming season to be no different. The feedback has been consistently positive and we continue to evolve our model in terms both in terms of the product we offer, the waves and how we benefit the local community, with donations to a range of community groups. With only few spots per trip available, make sure your spots do not get booked out! 11-20 May: The Weather Coast. For the last couple of years in May we have quietly enjoyed long period south swells unloading on a very remote south facing coast. And in May there has been little or no trade wind activity set in yet – i.e. perfect conditions. Join Us! Expect an adventure and the chance to surf waves never or rarely surfed before and visit areas rarely seen by outsiders. Be among the first in history to surf these coasts…. Please get in contact for details. Tony, Cynthia, Steve & Simon…. Wow, where to begin? the adventure provided by Tony and Jon is one of the most memorable surfing trips I’ve ever had. It not often surfing trips enable you to immerse yourself in such an amazing culture. Though the waves do not quite rival that of indo they are perfect and pack a punch, but the best thing about the surfing is you are guaranteed not to see another surfer in the line up other then the guys you are on the trip with. 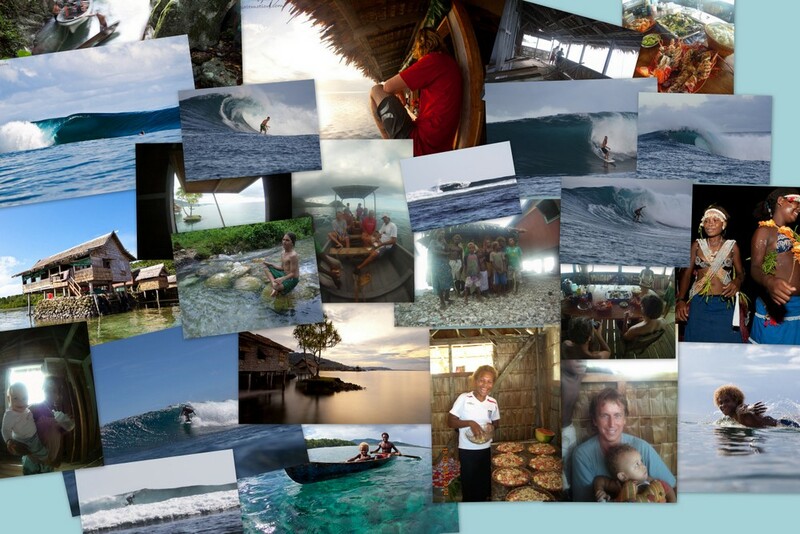 This trip is for all those surfers out there looking to get off the beating track and gain an amazing experience. Would I go back? Absolutely! I wanted to thank you and Steve… what an unbelievable experience I have had!! Whilst we scored such fun waves in world class surf, it was the way you run your operation and the people involved that made the trip. Joyce is amazing – she really seems to understand exactly what we would like and it made things so relaxing. Jack was a character – his organization getting me back to Honiara was perfect. Steve did a superb job ensuring everything continued on smoothly. My ability certainly didn’t do justice to the seemingly endless potential of the North Malaita region. Steve and I surfed The Mountain one afternoon and scored perfect little 2’ – 3’ lefts – just the two of us out… it was a special session as we had expected it to be too small to surf. Yesterday we had a great session at Charlie’s (both the right and the left) with all the boys getting a few crackers. In the afternoon, we surfed Fou-Fou (on the right) for my last surf… and again all the boys were into it getting some of the more solid waves we had seen! It was a great crew and I was really sorry to say goodbye. ‘Highlight: not seeing a single other tourist for the two weeks we were there. The locals treat you like royalty and could not be friendlier. I’d imagine a similar experience would have been Indonesia 30 years ago. Tony gave us great insights into the fascinating cultural, political and social histories of each area we stayed. The best travel experience that I have had – and that is before mentioning the waves!’ Henry Berresford, Jersey, U.K.
‘Fantastic trip, everything I could have asked for and more! Surfed 6 different waves over a two week period all to ourselves. Waves ranged from playful to boardbreaking. The village stays were an amazing experience meeting so many friendly locals and sharing the Solomons culture. Great cooking from Cynthia and thanks to Tony for making the trip run so smoothly considering no tourists ever come to Malaita!’ Rich, Jersey, C.I., U.K.